NOTICE: Activation key must be used on a valid Steam account, requires internet connection. ABOUT THE GAME	Be your own boss! 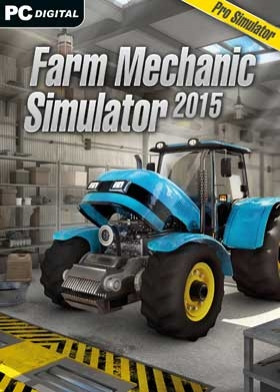 Enjoy your new career at an authentic farm repair service with Farm Mechanic Simulator 2015. This game gives you a fascinating insight into life of a countryside mechanical facility. Prepare yourself for big adventures with big machines. It's better than reality!KEY … FEATURES Work on many different farm machines including tractors and harvesters Do over 80 unique repairs such as brakes, transmission, engine, special equipment, etc. Interact with the owners of farm machines seeking repairs Order parts and materials necessary to maintain your inventory Keep the costs low by buying used parts to run a profitable business Purchase repair manuals to enable you to work better, faster and earn more moneySYSTEM REQUIREMENTS Minimum: OS: Windows XP/Vista/7/8 Processor: Pentium Core 2 Duo Memory: 2 GB RAM Graphics card: 256 MB (GeForce 8600 GT or higher) Recommended: OS: Windows Vista/7/8 Processor: Core Quad Memory: 4 GB RAM Graphics card: 512 MB or higher (GeForce 550 or higher) © 2015 and published by Ravenscourt, a Division of Koch Media GmbH, Austria. Developed by PlayWay & Si7. Ravenscourt and its respective logos are trademarks of Koch Media GmbH. All other trademarks, logos and copyrights are property of their respective owners. All rights reserved.